Boat detailing is becoming increasingly popular with many big brands offering various boat polish and oxidation removers. These products are needed as the marine environment and UV rays overtime cause fiberglass and gelcoats to fade. The best boat polish is the 3M 09005 Restorer and Wax, which removes heavy oxidation and defects whilst leaving a protection for fiberglass and gelcoat surfaces. Marine polish should not be confused with boat wax because polish removes the defects whereas wax will provide a protective layer and increase shine. You will want to use a buffing compound for boats to remove the defects before waxing. Application of boat polish can be achieved by machine or hand with both being able to remove heavy oxidation with the correct compound. 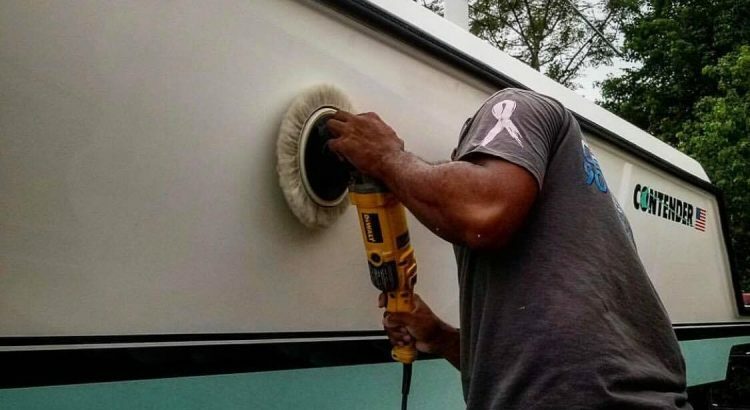 We highly recommend using a buffer for boat detailing as you will be able to cut into the fiberglass or gelcoat far more easier, which will result in a better finish. Boats that have been sat in the water all year round without using suitable boat covers may have a variety of defects. Removing these defects will not only improve the appearance of the boat but also add to the resale value too. It may be tempting to use an automotive polish but they are not designed to tackle fiberglass or gelcoat surfaces. Below is a list of the best boat polishes that can be applied by hand or machine, which will remove defects and restore shine. 3M are a market leader in both automotive and marine detailing products and their 09005 polish aims to remove heavy oxidation. This marine polish is also a wax that provides protection to your fiberglass and gelcoat surfaces. Overall, it is the best boat polish for those that want an all-in-one product that restores and protects. It works great on both gelcoat and fiberglass boats where it aims to remove oxidation, chalking, fading and minor scratches. Meguiars are market leaders within the automotive detailing industry but they also produce a range of marine products too. The M6732 is a boat buffing compound that effectively restores gelcoat and fiberglass that results in a high-gloss finish. With the reputable backing of Meguiar’s, you have the peace of mind that this polish will produce excellent results. It is the best buffing compound for boats that require a more aggressive formula to remove tougher defects. Chemical Guys are a big detailing brand that have a wide variety of products available. Their MBW11016 boat polish provides effective cutting of heavily oxidized surfaces as well as scruffs, scratches and other defects. Although you can apply this boat polish by machine or hand, the brand themselves even state that you can achieve better results by machine. Unlike the other polishes, this formula is fairly thick and you will need to work the product into the surfaces slightly more in order to get the best results. Using an advanced abrasive formula, the product starts strong to remove any oxidation and then finishes lightly for a deep shine. Overall, it is a great boat polish that will leave you with the perfect surface for applying a sealant or other protective polish after buffing the surface. For pontoon and aluminum boats, you may want to invest into a polish that is specifically designed for aluminum. This is where the 3M 09020 becomes very useful because it restores aluminum back to its original shiny finish. For tackling light to medium oxidation on aluminum boats, the 3M 09020 is the perfect solution. It is the best aluminum boat polish available and can completely transform your boat with the concentrated formula. Flitz polish and paint restorer is based from an anti tarnish formula that is highly effective and can last up to 6 months. The polish is a non-toxic cream formula and is most effective on metal, plastic and fiberglass materials. The hull and many other areas of a boat can suffer from oxidation, tarnish, rust, water stains, discoloration and scuff marks. This marine polish paste aims to rectify every single one of these defects with ease. It is a highly rated boat polish that can be used on a wide range of different surfaces and tackles defects effectively. However, as the formula is non-abrasive, it may require multiple application to remove tough oxidation. TotalBoat are known within the marine industry for their epoxy, paint, boat deck paint and various other products. They are very reputable for these products but they also produce a fast cutting fiberglass boat polish with an easy on and off formula. TotalBoat recommend themselves that you are able to achieve the same results by hand than using a buffer machine. All their products are created by boaters and made for boaters, so you can rest assure that the results you will see will be impressive. Boats that spend the majority of their time on the water without a cover placed over it can suffer badly from the marine environment. Defects such as oxidation, scratches, bird dropping and much more can ruin the appearance of your boat. Boat detailing is becoming very popular with many of the automotive brands providing a marine alternatives for people to use on their boats. Some are all-in-one products whereas some are primarily a buffing compound for boats. To help you make an informed buying decision when it comes to boat polish, we have produced an informative buying guide as shown below. It may be tempting to use a bottle of polish that you have for your car on your boat. However, you will struggle to cut into the fiberglass or gelcoat surface to remove the defects with most automotive polishes. This is because almost all automotive alternatives are designed for painted surfaces. Using a specifically designed boat polish that is designed for the marine environment will provide a much better experience. Not only will it cut into the surfaces easily but many provide additional protection qualities that protect against UV rays, water spots and much more. 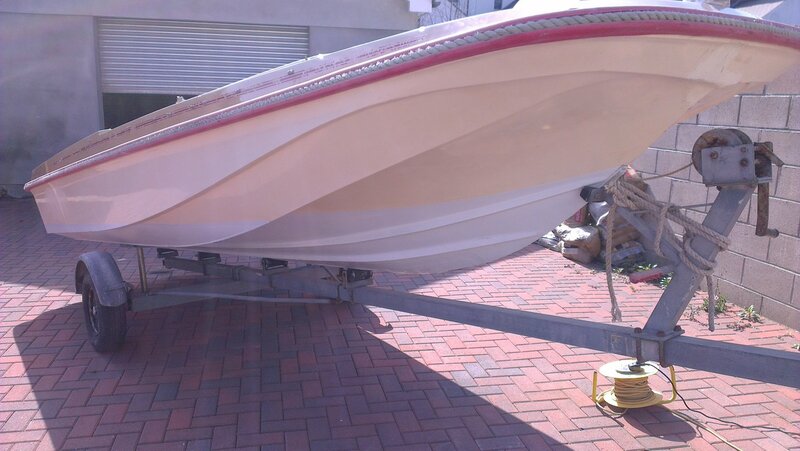 Application of boat polish can be very tiresome depending upon the size of your boat. Therefore, it is recommended that you use a buffer to apply the polish as it will allow you to cover more of the surface faster as well as cut into the fiberglass or gelcoat more easily. Most professional boat detailers recommend that you use limited pressure and set the buffer to spin at around 1,200 to 1,500 RPM in order to cut into the dull surface. Of course, there is no reason why you cannot use your hand to apply the polish. Some people may use a mixture of machine or hand polishing for those tricky to reach areas. However, if you have a large boat, it is going to take a lot of time and effort. We recently took on a fiberglass boat restoration project where the boat had suffered heavy oxidation. 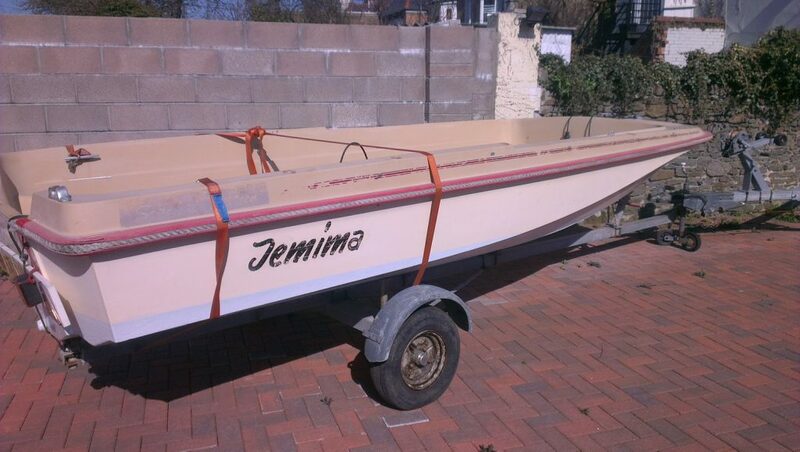 Our task restore the finish and remove the decal that had been glued onto the boat by the previous owner. Below is a picture of the boat before using a buffer and boat polish. Thoroughly Clean The Boat. Using warm water and a strong washing solution, wash every inch of the boat removing all dirt and debris. Failing to remove dirt can result in scratches at step 2 where the dirt gets in between the polishing pad and fiberglass. Polishing Using a Buffer Machine. Using a buffer machine of your choice (rotary or dual action) add four dots in a square shape onto the pad and rub it onto the boat (switched off). After its rubbed in, apply the buffer machine onto the work area and work the polish until it turns clear. Wipe off the residue to display results, if its not shiny enough, redo the area until you are happy with the finish. Wax to Provide Protection. Waxing the fiberglass bodywork provides protection against oxidation and stains. Regular waxing can see the gloss finish lasting over 10 years without needing a buffer. Apply the boat wax in a circular motion and let it haze up before removing the residue. Below are some results after restoring the fiberglass on the neglected boat. As you can see, the painted name “Jemima” that was glued onto the boat was successfully removed using a strong abrasive compound. Once we had completed the project, we put it up for sale and made good profits on the boat, which we were pleased about. Seeing the end results is fairly impressive too and we strongly recommend using any of the polishes within this article to achieve the same finish. Removing oxidation from your boat does not require the strongest polishing compound on the market. 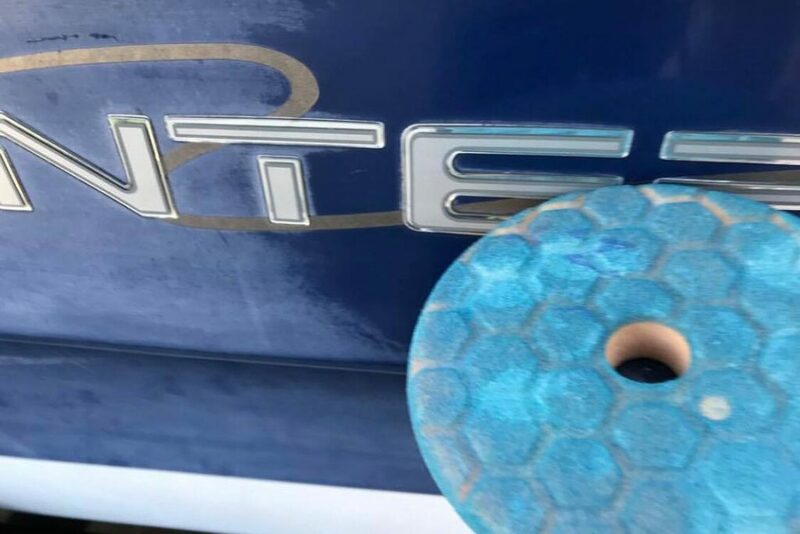 Buffing the boat should always begin with the least abrasive to begin with as you don’t want to remove a large layer of the clear coat straight away. For tougher stains or boat signage, you may require a stronger abrasive to restore the color and shine. The ease of restoring the shine is unbelievable but many people choose not to and lose out on the resale value of their boat. Polishing your boat can be a time consuming task but with the correct boat polish and technique, you can achieve impressive results. All of the recommendations are highly rated among boat detailing professionals and are relatively cheap too. If you have multiple surface such as fiberglass, gelcoat or aluminum surfaces, it may be worthwhile getting specific polishes. This will allow you to tackle any form of oxidation or other defects with ease. I noticed Flitz has no warning labels. As I recall there is nothing toxic about it . All the other products have warning labels. Not to mention you can use it on any surface on the boat. I have got marks off the fenders with no harm to them. Bright work, lexan ,glass ,even you tackle box .hooks , knives. I think that makes it a much better value and environmentally safe. Just something I thought from my experience about why I use Flitz. Surprised it was not #1 for the Value and all the other uses.